Supercell storm beginning to get its act together near Bennington, KS. Inflow bands becoming more defined in all directions. First funnel forms at 5:31 PM CDT as we watch a couple miles to the east. 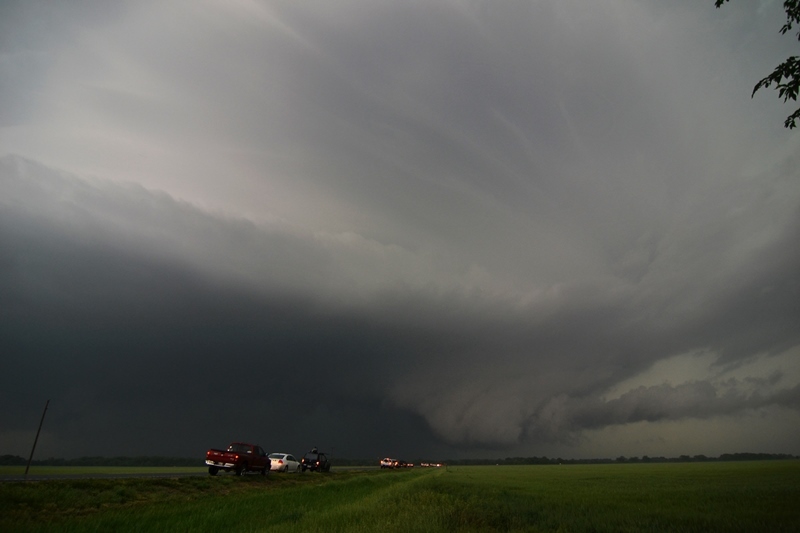 After the funnel, a lowering forms underneath the updraft as inflow into the storm strengthens, indicating increasing tornado potential. Moisture rich inflow air being sucked right into the action area underneath the storm updraft as wall cloud forms. The tornado first forms at 5:47 PM CDT. Tornado getting larger with inflow surging in from right to left. Thick cone tornado underneath rapidly rotating mesocylone. Tornado has barely moved. Well defined and strong stovepipe tornado at this point. Condensation surging up the left side of the tornado. 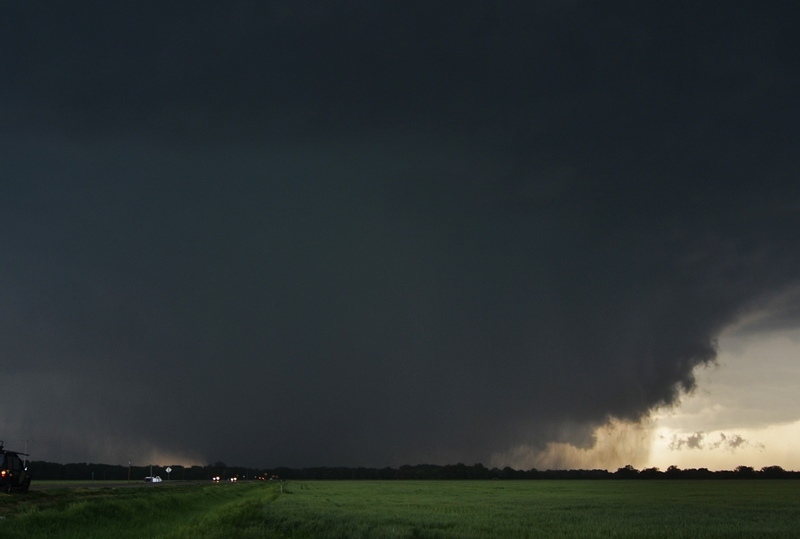 Zoomed out view showing the incredible storm structure and the stovepipe tornado. 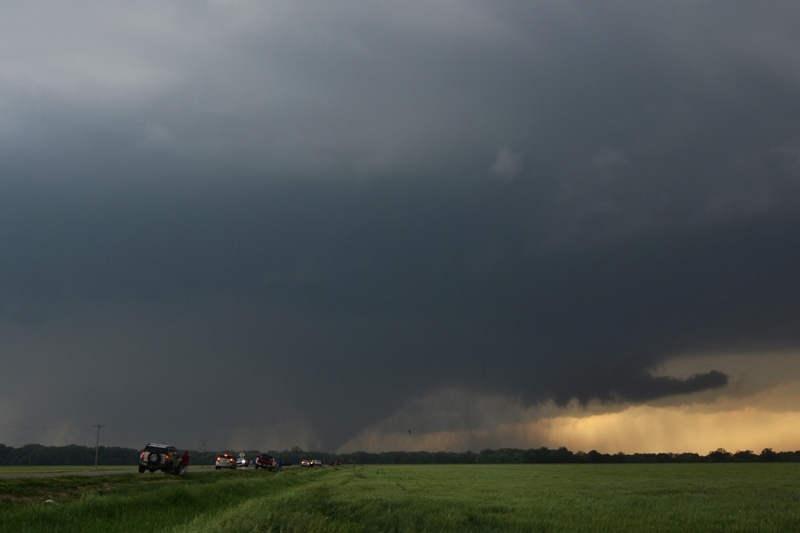 Another shot of the tornado at 5:54 PM CDT. Tornado becomes rain-wrapped at 6:02 PM CDT. Tornado getting back out of the rain at 6:03 PM CDT. What an awesome storm and tornado! Tornado and storm has not moved hardly at all while we have been watching. 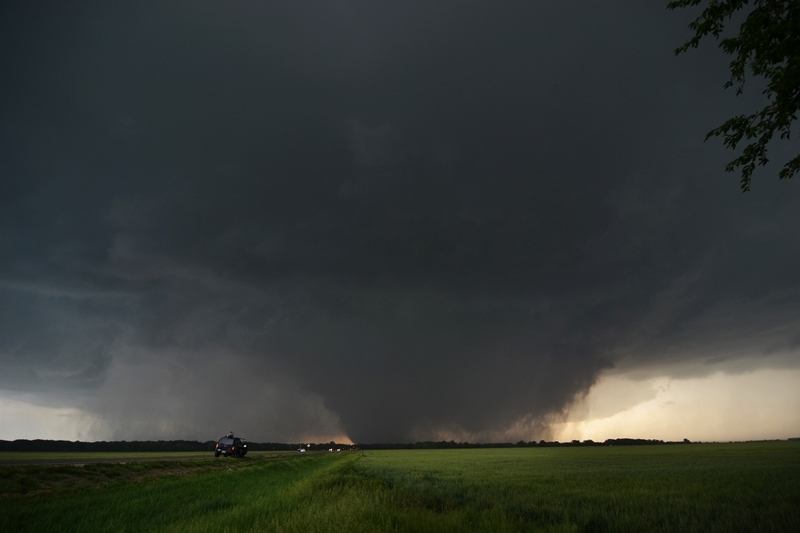 Another shot of the wedge tornado with heavy core to the left and inflow tail to the right. Transitioning to a big high precipitation (HP) supercell as the tornado becomes rain-wrapped. Tornado finally ended after nearly an hour! New wall cloud forming while an attempt to produce another tornado ensues. Incredible structure to this supercell with long, striated inflow bands around the mesocyclone and wall cloud underneath. Massive hook echo on the storm while we sit directly east of the notch. Our location is plotted as the white circle with a dot in the middle. We sat in the same spot the entire life cycle of the tornado and afterwards as the entire storm and tornado hardly even moved! Velocity couplet showing the tornadic circulation relative to your position as plotted by the white circle and dot. A great chase day and one of the shortest ever driven for a chase! The toughest part of this day was figuring out our target. 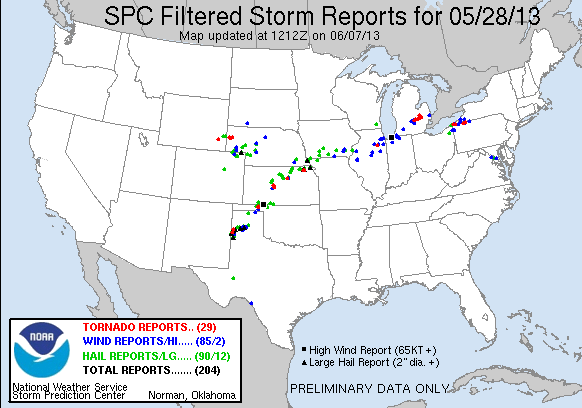 We started the day in Salina, sleeping in a little and waking to discover that we had 3 distinct targets to consider: Northeast Kansas just east of where we were, along the boundary with a good combination of shear and moisture, a nice high plains setup in Northeast Colorado, or the southwest part of the boundary near Dodge City. We agonized for a bit and told the guests we’d meet an hour later, then decided that at least we would not take the Cheyenne Ridge bait and hedge more about where on the boundary to play, so we waited, then went to lunch, hung out at Walmart, then parked at the Petro on the north side of town to wait some more, as by now we’d decided to play the northeast target. Problem was, it looked like we’d waited too long with a cell already dropping a tornado in the Manhattan, KS area, 100 miles east of us and out of range! However, we calmed down and reasoned that if we could get a cell to develop and right turn into the same environment that the Manhattan storm developed in, it should do the same thing. Plus there was a nice triple point setting up just to the west of Salina as boundaries became more established by the afternoon. 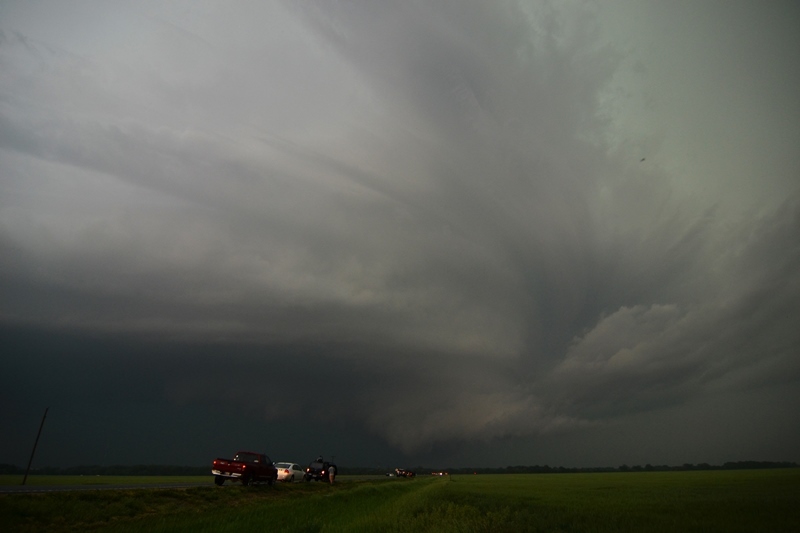 We continued to wait as towers bubbled all around us and more and more chasers parked and chatted with us, until finally an updraft just to our west took off and we headed out north on old Highway 81 after it. The storm was not moving fast at all, and we were easily able to get east of it, parking on Rt. 18 just west of Bennington, KS. As we watched, the storm, which was really a group of updrafts, began to congeal into one and showed immediate signs of rotation, much as the Manhattan storm had earlier. We kept our fingers crossed as a cell to the south merged with it, and the cell survived and was soon a rotating monster! The rotation under the mesocyclone continued to increase until, 35 minutes after we initially parked, a long elephant trunk funnel formed, making it 2/3 of the way to the ground before dissipating a minute or two later with a neat ropeout. By now, the wall cloud was spinning like crazy and it was only a matter of time before it tornadoed, and 15 minutes later the storm dropped a big cone about 3 miles west of us and slowly coming directly at us. As it got closer, you could get a good feel for how violent the tornado really was, and soon Bennington was sounding their tornado sirens. As the tornado closed on us, it spawned a brief satellite tornado to its south and occasionally got wrapped in rain. 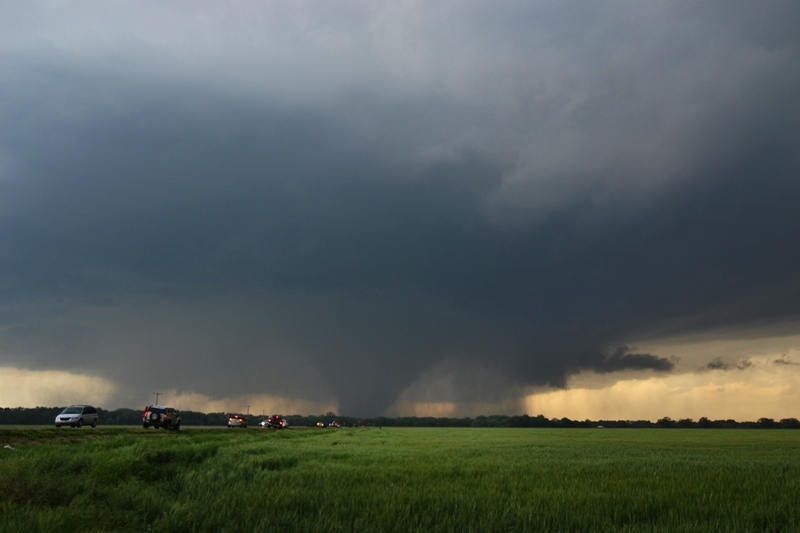 Soon the tornado turned into a monster ½ mile wide wedge that was rotating around a nearly stationary mesocyclone of the storm. What a moose! The structure and slow motion of the storm was incredible, with a striated updraft and inflow bands streaming in from all directions and wrapping around the updraft. As we sat still in our original spot now for the 2nd hour, something I’d never seen before happened: The storm began to retrograde and soon the storm and the tornado were moving west away from us! At this point the whole tornado was rain-wrapped from our vantage, but the motion of the cloud base and inflow told us it was still in there. Finally it seemed to wind down and the storm went into obvious HP mode, dumping well over 6 inches of water on the same area as where the tornado ground away. Worried about the flash flood warning, we finally left the area about 2.5 hours later, having never moved once after we stopped! A fantastic chase day virtually right on top of us. In fact, I measured and from the Petro parking lot to where we watched the storm unfold was only 10.4 miles! Incredible! We headed to Logan’s for a nice steak dinner, then to the hotel in Wichita for the night.